- Passes should be caught as players end their cut with a two-footed quick stop. Players set up as shown. 1 passes to 3, 3 makes a cut to catch the ball in the high post area. After passing 1 sets a screen. 3 quickly takes the ball overhead and passes to 4 on the weak side, 4 makes a cut to receive the ball. On the 3 to 4 pass 2 is moving towards the screen set by 1 (setting up his defensive man). 3 slides away from his pass towards the cone at free throw line extended. 4 passes to 2 for the lay-up and follows to rebound the ball. 3 runs around the cone and finishes where 4 was. The screener rolls to the basket but backs out as the pass goes to 2. The 4 to 2 pass is timed so that no dribble is required and 2 shoots the lay-up. After shooting 2 sprints to the top of the key to become the new high post. 1 goes to the cutter position where 2 started. 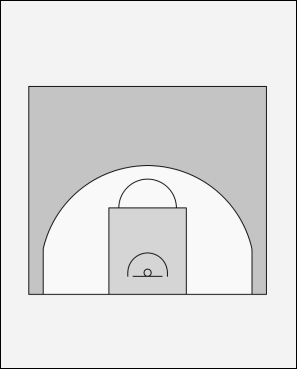 2 goes to the high post area where 3 started. 4 Rebounds the ball and makes an outlet pass to 5 who has stepped onto court. And the drill begins again. 1 has gone to the cutter position where 2 started. 2 has moved to the high post area where 3 started. 3 has moved around the cone to 4's starting point. After making the outlet pass 4 joins the end of the line out of court. 4) Place defenders on 2 and 4 spot, allow 4 choice of shot, drive or feed pass to 1 or 2, Coach decides intensity of defense. Suggestion: X2 allows himself to be screened and X4 plays hard defense. X2 can give help after being blocked out by screener on the roll to the basket.